A businessperson opens their doors to make money. New business owner’s rarely have enough funds to hire a full time staff. Consequently, they rely on the services of an independent contractor. 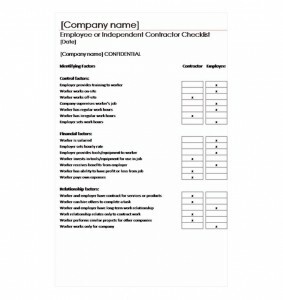 Before hiring an independent contractor, the owner should review a contractor checklist. A contractor checklist is ready for download on this page. There are a number of important steps to follow to make sure that the contractor and business are protected. Let’s take a further look at the advantages associated with a contractor checklist. Now you are at the stage where you are seriously considering hiring a contractor for a business or personal reason. At this point many wonder if hiring an independent contractor is the best option for them. A contractor checklist will clarify the point. It will help you determine if it is a cost effective option or should you hire a full time staff. What you need to make a important decision is provided on this page. The checklist is provided for free. The contractor checklist is easy to manage. Download the free checklist and customize the document to meet your special requirements. First, it is important to remember that often, the checklist is the only document that shows evidence that there was a mutual agreement between the parties evolved. It is important to have the independent contractor to review and sign the checklist, if a formal contract is not involved with the work. This is important from a legal view. Second, Make several copies of the checklist and share them with the worker. Keep other copies with tax and business records. Third, store the checklist in a safe place for quick retrieval. For example, store on your computer, store in a desk file, or a records room. Today, many business owner’s are using cloud storage. Consider this option for your transactions.